BackgroundTo date, there is no consensus on ideal ways to measure antiretroviral treatment (ART) adherence in resource limited settings. 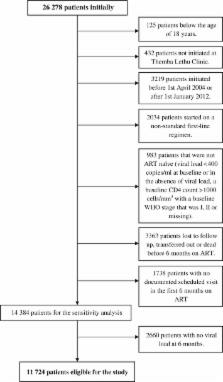 This study aimed to identify markers of poor adherence to ART.MethodsRetrospective data of HIV-positive ART-naïve adults initiating standard first-line ART at Themba Lethu Clinic, Helen Joseph Hospital, Johannesburg, South Africa from April 2004 to December 2011 were analysed. Poisson regression models with robust error variance were used to assessed the following potential markers of poor adherence ‘last self-reported adherence, missed clinic visits, mean corpuscular volume (MCV), CD4 count against definition of adherence, suppressed HIV viral load using traditional test metrics’.ResultsA total of 11 724 patients were eligible; 1712 (14.6%) had unsuppressed viral load within 6 months after initiating ART. The main marker of poor adherence was a combination of change in CD4 count and MCV; change in CD4 ≥expected and change in MCV <14.5 fL (RR 2.82, 95% CI 2.16–3.67), change in CD4 <expected and change in MCV <14.5 fL (RR 5.49, 95% CI 4.13–7.30) compared to change in CD4 ≥expected and change in MCV ≥14.5 fL.ConclusionsA combination of less than expected increase in CD4 and MCV at 6 months after treatment initation was found to be a marker of poor adherence. This could help identify and monitor poor treatment adherence in the absence of viral load testing. Less than 95% adherence to nonnucleoside reverse-transcriptase inhibitor therapy can lead to viral suppression. For antiretroviral therapy, the 95% adherence "threshold" is based on nucloside-exposed patients who are receiving partially suppressive, unboosted protease inhibitor regimens. Using unannounced pill counts and electronic medication monitoring, viral suppression is common with a 54%-100% mean adherence level to nonnucleoside reverse-transcriptase-inhibitor regimens. Although perfect adherence is an important goal, viral suppression is possible with moderate adherence to potent regimens. Predictors of HIV drug-resistance mutations in a large antiretroviral-naive cohort initiating triple antiretroviral therapy. The objective of this study was to systematically characterize the incidence and determinants of antiretroviral resistance in the HOMER (Highly Active Antiretroviral Therapy [HAART] Observational Medical Evaluation and Research) cohort of 1191 human immunodeficiency virus-infected, antiretroviral-naive adults initiating HAART in British Columbia, Canada. All plasma samples with plasma virus loads (pVLs) >1000 copies/mL collected during the first 30 months of follow-up were genotyped for drug resistance. The primary outcome measure was time to the first detection of major drug-resistance mutation(s). Cox proportional hazard regression was used to identify factors significantly associated with the detection of drug-resistance mutations. Drug-resistance mutations were detected in 298 subjects (25%). Factors significantly associated with detection of drug-resistance mutations included high baseline pVL (multivariate hazard ratio [HR], 1.59; P /=95%) refill percentages but with 2 plasma drug concentrations below the steady-state trough concentration minus 1 standard deviation (multivariate HR, 4.57; P<.001). Initial use of nonnucleoside reverse-transcriptase inhibitor-based HAART was significantly associated with multiclass drug resistance (multivariate HR, 1.84; P=.001). High baseline pVLs and substantial but imperfect levels of adherence were major predictors of antiretroviral resistance. [d ] Department of Public Health, School of Health Sciences, Monash University , Johannesburg, South Africa. Copyright statement: © The Author 2017. Published by Oxford University Press on behalf Royal Society of Tropical Medicine and Hygiene. Predictors of outpatient medical appointment attendance among persons with HIV.